they venture north of Perth. It is a small but friendly community whose focus is predominately the wheat and sheep farming in the surrounding area. Miling is also the terminus of one of W.A. 's most scenic railway lines which winds back to Perth through some of the state’s most productive farming land, including the Avon Valley. 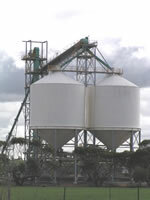 The most obvious landmark within the town is the grain receival complex (C.B.H.). This facility handles in excess of one hundred thousand tonnes of wheat, barley and lupins per year; this makes Miling one of the larger inland receival points in the state and easily the largest in the Moora Shire. Harvest time between November and January is when the wheat bins and all the surrounding farms become a hive of activity as the grain is harvested and then transported from the paddock to the bin. Miling was established on its present site in 1925 when the railway was completed. There was already a thriving group of farmers in the area, the first of these had arrived in 1906 to start clearing the virgin bush blocks they had selected. This early group settled around an area approximately eight kilometres north east of Miling that contained a natural spring called the Duckling Mining Spring. The name Miling was derived from this spring and there was a deliberate change of a road sign by one of the early settlers that cemented the change. The population of the area grew constantly through the decades as farms were developed and productivity increased through the advent of superphosphate fertiliser and subterranean clover. As the size of machinery grew and the value of commodities fell farmers started to increase their acreages and employ less people, this led to a population decline that has continued from the late 1960s to the present day. Miling stands on one of Australia's main arterial highways and daily sees the full diversity of travellers. Those who stop no doubt appreciate the subtle attractions the town has to offer. Opportunities exist in the form of a small number of unused buildings, both commercial and residential, that could be developed into additional businesses for the town. The farms that surround the town provide the financial backbone of the town and any new ventures would need to focus on this to some degree. Most community services that can't be found in Miling exist in the regional centre of Moora, approximately thirty minutes drive away.